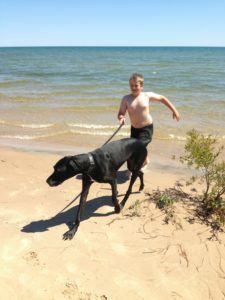 Logan Bouchard runs with his dog Luke at Negwegon State Park’s sandy beach, courtesy Alisha Bouchard. Alpena is centrally located to three individually unique Michigan state parks. Each park has its own personality, unique features, and special landscape. All three parks are also designated Dark Sky Preserves. Located 24 miles north of Alpena on US 23 North, this natural area encompasses 5,000 acres of sand dunes, upland and marsh. In Michigan there are fewer than 50 remaining examples of “forested wet swale communities” of this quality. The area supports one of the largest known populations in the world of the federal and state-threatened dwarf lake iris, Michigan’s state wildflower. Thousands of iris shoots, and several other plant species of special concern grow in the area. Situated along seven and a half miles of Lake Huron shoreline, this undeveloped park provides a rustic retreat for hikers exploring the park’s six miles of trails. Park at the trail-head off of US-23. Rockport offers pristine views, multiple beaches, fossil hunting, trails, a bat hibernaculum, a shipwreck, a ghost village, and deep water fishing port. located on the shores of Lake Huron north of Alpena. 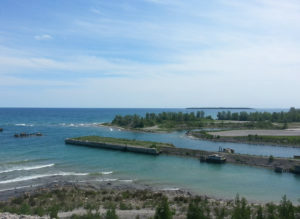 The property includes a deep-water protected harbor, an old limestone quarry of approximately 300 acres, a unique series of sinkholes, the Besser Natural Area, and a broad range of land types, vegetative cover, cultural resources and recreation opportunities. At the harbor, the DNR has a boat launch facility, and there is a small park with picnic areas. Print out this handy Rockport State Recreation Area Adventure Guide to start your exploration of Michigan’s 100th State Park. 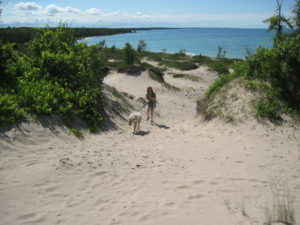 Sand dunes are a hidden treasure at Thompson’s Harbor. Photo Courtesy Gary Irving. , turn right or east at the Negwegon State Park sign and go 1.5 miles to the day use parking area. No services, back country camping available. As of February 16, 2016, Negwegon State Park, Rockport State Recreation Area, and Thompson’s Harbor State Park have been officially named Dark Sky Preserves. These parks are now protected from artificial light pollution and provide amazing night sky photography and stargazing. Download the Dark Sky Adventure Guide to start your journey.